All orders and contracts are accepted subject to the following Terms and Conditions of Sale to the exclusion of any other Terms and Conditions and may not be altered unless agreed in writing by a Director of the Company. b. Cheque or Bank Transfer with order or prior to despatch. All prices are subject to VAT at the current rate. The company reserves the right to amend prices quoted should specifications or any other requirements change or to reflect any increased costs. Prices are reviewed on an ongoing basis and are subject to change without prior notice. Until such time as the Company has been paid in full for any goods supplied and delivered, the goods will remain the sole and absolute property of Abcon Industrial Products Ltd. The company reserves the right to repossess the goods to which it has title and to enter the customer’s premises, property or land to effect repossession of all goods for which payment has not been made in accordance with stated payment terms. Quotations by the company for delivery ex-stock are made subject to availability and such goods remaining unsold at the time of receipt of purchase order from the customer. Abcon reserves the right to fulfil outstanding balances as and when stocks are available. The company will endeavour to meet any reasonable delivery request made by the customer. Order quantities will ship in the nearest pack quantity. Claims for incorrect, short delivered or damaged goods must be notified to the company within 5 working days of receipt. Returns should only be made with the express authority of the company. Abcon disclaim any responsibility for any goods returned without authority. A handling charge may be applied. Goods ordered in error by the customer may only be returned if they are standard Products in original packaging and in the customer’s possession for not more than 30 days. Returns are not accepted for any goods that are specially manufactured to meet the buyer’s requirement of either specification or large quantity. In the interest of ongoing development the company reserves the right to change product specifications without prior notice. All literature is subject to change without notice. 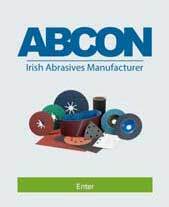 In the event of any dispute arising between the company and its customers, it is deemed that any dispute will be settled according to Irish Law. Goods supplied by Abcon are warranted to the customer to be free from defects in material and workmanship at the time of shipment. All warranty claims shall be made within 6 months after we have shipped the goods. Our liability hereunder is limited to the purchase price of any product proven defective or, at our option, to the replacement of such goods upon its authorised return to us. Any warranty issue will be subject to inspection by the company to ascertain the validity of the claim. This warranty is in lieu of and excludes all other warranties, expressed, implied or statutory, or otherwise created under applicable law included, but not limited to, the warranty of merchantability and the warranty of fitness for a particular purpose. In no event shall we be liable for special, incidental, or consequential damages, including loss of profits.